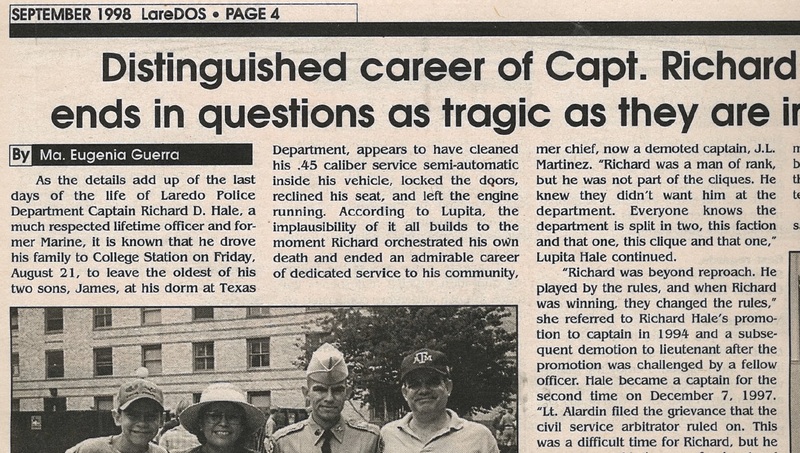 Hale was a devoted family man, and a dedicated veteran of the Laredo Police Dept. Meg Guerra's writing in the September 1998 issue of LareDOS doesn't hint at any reason that would lead Cpt. Hale to take his own life. The occurrence left everyone around him baffled. On September 7, 2011, Constable Tino Juarez passed away. It was determined that he died of a self-inflicted gunshot wound to the chest. He was at home when he turned the gun on himself. Last week, another local officer took his own life, the circumstances matching that of Hale and Juarez: a lethal bullet wound to the chest. Lt. David Medina, an officer with LISD, was found unresponsive at the law enforcement gun range Tuesday afternoon. An investigation is ongoing, but officials do not suspect foul play at this point. News like this is so traumatic. I can't imagine what the families go through when something like this happens. From my point of view, these men were confronted with, what seemed to be, some insurmountable crisis. Their answer to the pain was a quick, yet brutal solution. These three individuals, who dedicated their lives to public service, now share an unfortunate distinction. Their loved ones will hopefully one day find peace. I took some photos of the work being done at the outlet mall to be opened on March 16. Media will be given a tour of the facilities next week. The people who construct places like these are never recognized. We always point to the times when things are open to the public or when they close, but never to the moments when people are actually putting down the last brick, or doing the menial tasks. January 12, 2017 Judge Garza arrested for the indictment: soliciting a loan. January 25, 2017 He turns in his letter of resignation. February 17, 2017 Judge Garza pleads not guilty. February 19, 2017 Laredo Times reports that local attorney, Victor Villarreal, sent Carlos Zaffirini an email containing the reason why he should selected to fill vacancy at Court at Law II. March 27, 2017 Commissioners Court unanimously selects Victor Villarreal as judge for Court at Law II. This house is located on the corner of Victoria and Davis Ave. It's been vacant for as long as I can remember. Pretty soon, it seems, it will meet the same fate as the Webb County Courthouse Annex: demolition by neglect. I don't expect this unique estate to be restored, and I'm definitely not suggesting that any local governing entity should take ownership of it. 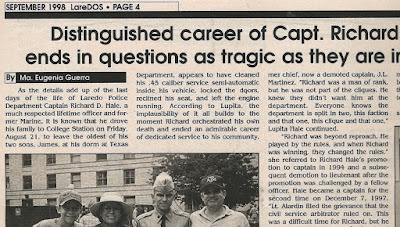 All I can do is archive the Laredo that I know at the present time, and take note of how some properties don't stand a chance, whether that's through necessity or a lack of will. There used to be an old church right across the street from it. I recall it standing, also abandoned, in the early 1990s. All that is left now is an empty lot. 07824: Assistant City Manager Robert Eads, Health Department Director Dr. Hector Gonzalez, Deputy City Manager Cynthia Collazo, Mayor Pete Saenz, Congressman Henry Cuellar, City Manager Jesus Olivares and Health Department Lab Supervisor Julia Perales pose with the oversized photogenic check representing the recent federal funds awarded to the Laredo Health Department for Zika testing and prevention. The Laredo Health Department will be using the funds for increasing their lab capacity, vehicles and trapping and eliminating mosquitos all in an effort to prevent Zika in Laredo and Zapata counties. This moment is the culmination of the endless work that the mayor, city manager, staff, and council put in. Their constant travels to D.C. net useful resources. At least that's what they tell us. 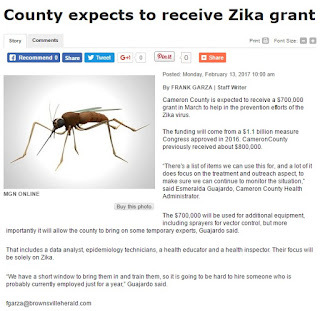 The Health Department getting money to combat Zika is great. But you can't tell me that all those people in the photo (and everybody that travels to D.C. every spring) had a hand in getting such grant money. 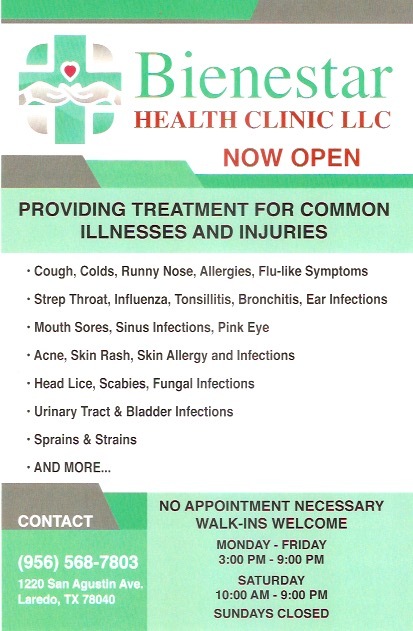 A more realistic photo, I would assume, would only include Dr. Gonzalez, Director of the Health Dept., Congressman Cuellar, and perhaps Ms. Julia Perales. They're probably the only ones who worked to get this money. And you know what? They probably didn't even have to make the trip to Washington to garner this money. Nevertheless, here's how Henry Cuellar tells it in his press release on Friday. Congress provided 394 million to the CDC as part of the Zika supplemental funding bill. 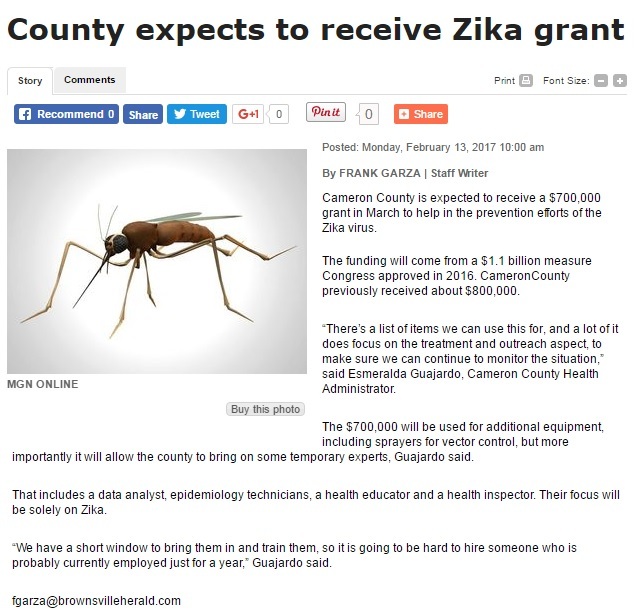 These funds were part of a $25 million federal allocation for Zika preparedness to the Texas Department of State Health Services (DSHS), about $10 million of which is flagged for local jurisdictions including 16 health departments. Those jurisdictions, including Laredo and Zapata County, were selected for their higher risk of Zika cases: mainly border, gulf coast, and urban areas. 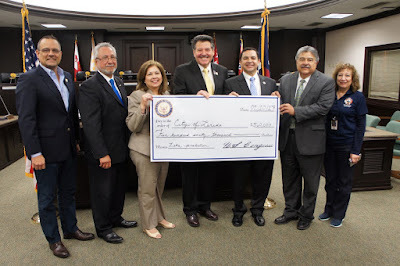 The City of Laredo will also conduct mosquito control operations in Zapata County with these funds. I'm starting to think that the photo ops that city hall and Henry Cuellar take part in are like Trump's executive order pressers. They pose while holding up a prop in hopes of impressing all of us. 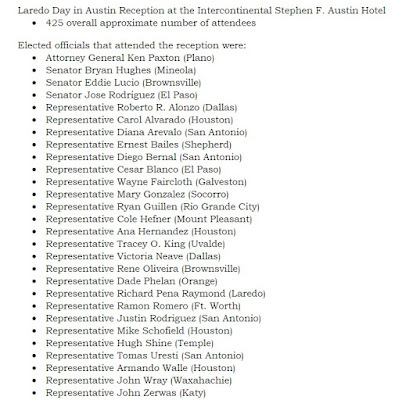 City officials went to Austin three days in January: the 23rd through the 25th. They met with people, and more people. And then they had a nice reception with hundreds of attendees. Of course, it was at a swanky place, the Intercontinental Stephen F. Austin Hotel. Must be nice. 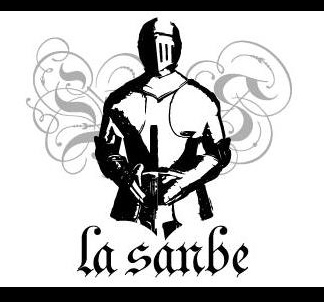 Images courtesy of the City of Laredo. 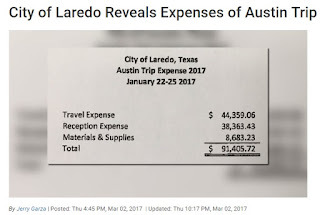 UPDATE: 3/3/2017 KGNS reports on expenses made by City of Laredo. Money for expenses, according to the city, comes from departmental travel budgets, the Convention & Visitors Bureau, and private donations. 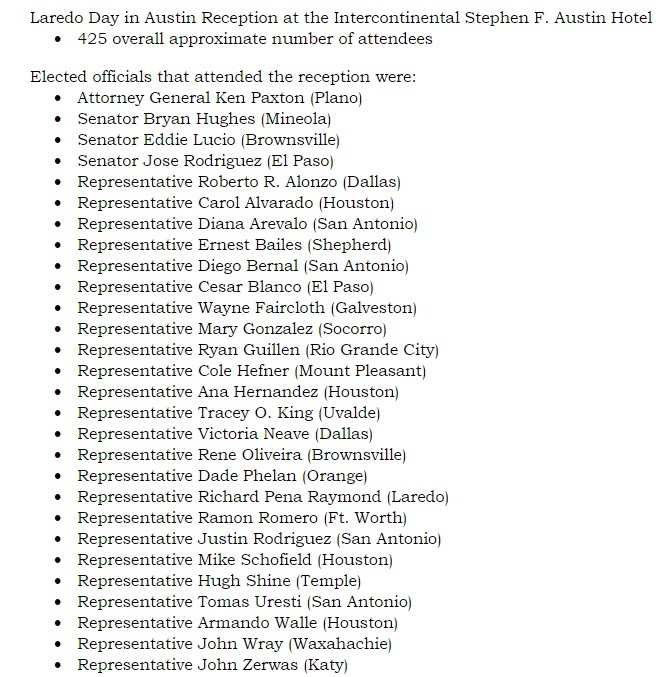 KGNS reported that 28 city employees went on the trip, as well as all of city council, except Roberto Balli. $8,683 was spent on materials and supplies. 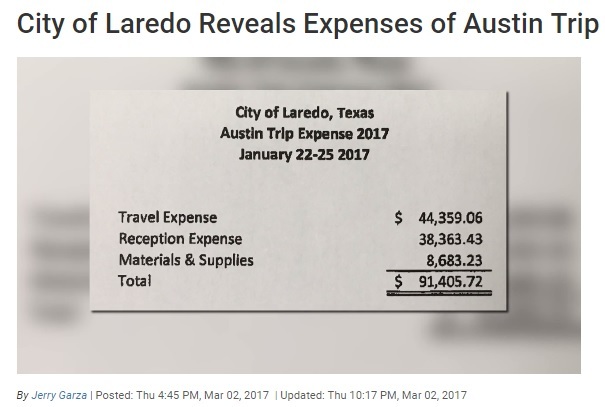 The itemized report provided by the City of Laredo included: $935 for souvenirs; $3,660 for ceramic bowls; and $4,088 for candies for trays and other supplies. Laredo ranks at the bottom when it comes to acknowledging the rights of the LGBTQ community, according to Human Rights Campaign. The LMT's Julia Wallace wrote that the city, along with its private sector, doesn't promote protections for those whose sexual identity is other*. By all means, we're not here to discriminate against anyone.....They deserve every protection. A welcoming gesture from the mayor -- until he goes all Hobby Lobby on us. We're there, we care, we love. But don't ask us to enable behavior that is against what we believe. Religious freedoms should be first and foremost. I think we should be able to protect those rights as well. They're being pitted against each other, and I think we need to respect each other's views. The mayor's religion first stance reminds me of the time when County Judge Rumitano Tijerina, in the summer of 2015, needed time to reflect, before deciding to marry gay couples in Webb County. The Supreme Court had just ruled that gay marriage was constitutional, but Tijerina wasn't jumping on board with the decision all that quick. Some time ago, city hall grappled with the issue of welcoming grant money to be used for women's contraceptive needs. Council's moral arbiter, Charlie San Miguel, sided against the grant, while pointing to his religious views. Juan Narvaez, in a stunning turn of clarity, said something to the effect of, we cannot proselytize our faith from the dais. 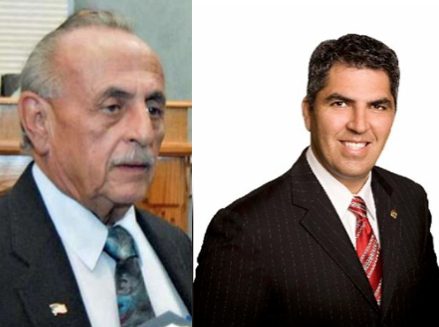 The Saenz's of the world made a conscious decision to throw their hat into the political arena, opting to represent ALL of Laredo or Webb County. They need to advocate for all their constituents, not just the ones who share their point of view. They need to understand that their take on religious freedoms can have real life, and economic consequences for the whole city, as well as for the most vulnerable among us. February 1, 2016 Unleaded gasoline is at $1.56 a gallon. 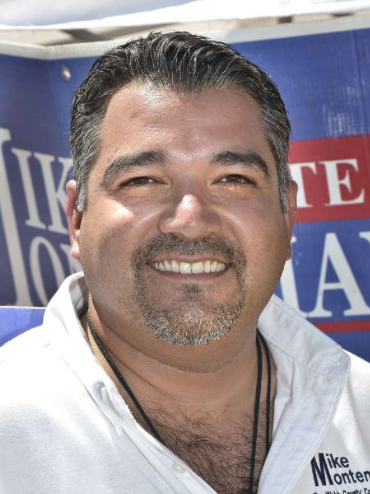 February 2, 2015 Shouting match between Roque Vela Jr. and Mayor Pete Saenz. February 3, 1986 Jose “Curly” Herrera killed by inmate at county jail. February 3, 2011 City starts sanding roads/bridges to combat icy conditions. LISD schools starting day at 10:00 a.m. on the 4th. February 3, 2016 Citations to start today if caught using phone while driving. February 3, 2017 KGNS: WBCA's Noche Mexicana Absent from 2017 Festivities. 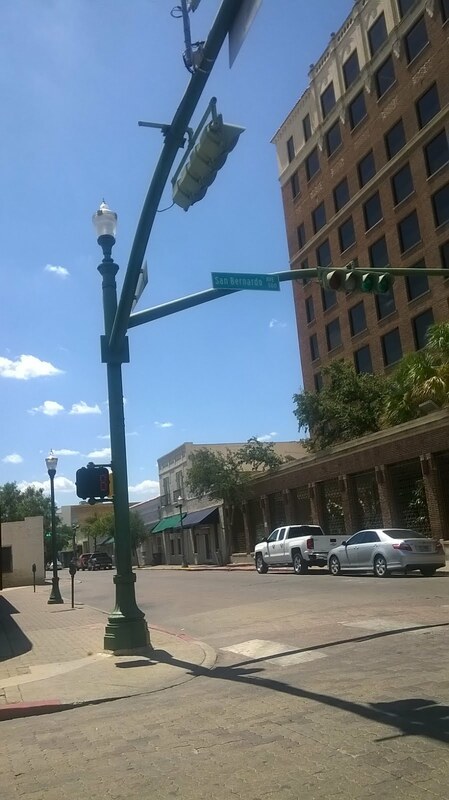 February 4, 2012 Sara Walls posts ‘Why Sara Hates Laredo’ video. February 6, 2012 Raul Salinas rails against Sara Walls. February 9, 2009 County commissioners set up committee for Laredo Raceway Park. February 11, 1955 Groundbreaking of Mercy Hospital in Heights neighborhood. February 11, 2008 Rick Flores at sheriff’s debate on KGNS: Mr. Carmona, he doesn’t need a drug test, he needs a psychological. February 11, 2016 Grand jury chose not to indict Auditor Leo Flores due to insufficient evidence. February 14, 1980 “Heatwave” Berler starts at KGNS. February 15, 1986 Honore Ligarde, former state representative, passed away. February 15, 1979 Judge Robert O’Conor Jr. grants TOPS $9,995.00 in attorney fees. February 16, 2001 Don Francisco & Maria Victoria featured at Senor Internacional ceremony at Civic Center. February 16, 2016 City council votes to purchase Canseco house on Chihuahua. February 17, 2012 Tivoli theater vintage photo in blog post. February 17, 2014 Las Marthas documentary debuts on PBS. February 17, 2018 Councilman Charlie San Miguel appears in grand parade with machine gun strapped on Jeep. States it was done to honor veterans. February 20, 2012 City officials travel to Kentucky to give Jack Strunk a key to the city. February 21, 2008 Hilary Clinton visits Laredo campaigning for president. February 21, 2017 LISD police officer shot dead at gun range off Hwy. 59. 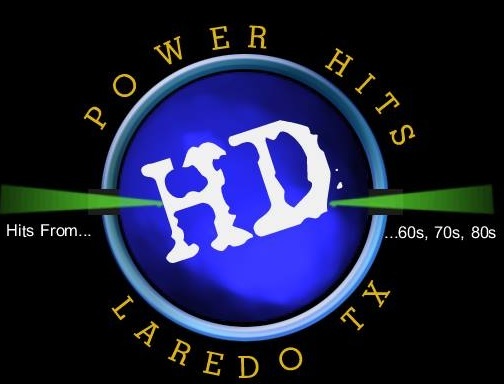 February 22, 2017 KLRN's 'DayTripper' Chet Garner visited Laredo, San Bernardo. February 22, 1933 1st International Frontier Olympics; became Border Olympics in 1938. February 23, 1892 The Laredo National Bank was founded. February 23, 2011 Uni-Trade donates $2,500 to City of Laredo for Washington trip. February 23, 2013 Mayor Salinas proclaims “Unity, Unity!” at WBCA Parade. February 23, 2019 House Speaker Nancy Pelosi took part in the abrazo ceremony on Bridge 2. February 24, 2006 City manager sends Gustavo Guevara letter of 30-day suspension for harassment charges. February 25, 2018 Mountain lion caught in the Santa Rita neighborhood. February 26, 1943 Lt. Socrates Pappas killed in action. Pappas street named after him. February 27, 1985 Helicopter used to dry Shirley Field track for Border Olympics. (Lanes not painted) Meet cancelled 2 days later. February 28, 2000 Laredo Times endorse George W. Bush in Republican primary and Al Gore in Democratic primary.